This Stars and Stripes Forever Easy Yogurt Popsicle Recipe is absolutely yummy. 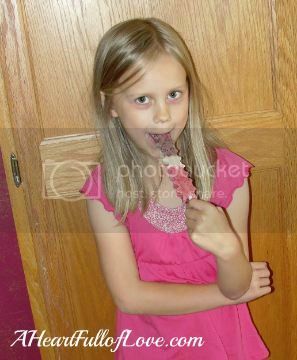 Your kids will gobble them up without ever knowing it is good for them! They are a great patriotic treat to make for either Memorial Day or the 4th of July. I love to come up with special crafts and recipes for each holiday. The 4th of July is no exception. 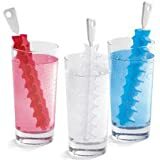 So when I came across a set of Wilton Silicone Star Ice Pop Molds, I knew they would make a fun 4th of July treat for my kids. I brought them home and immediately used them to make some cute frozen yogurt pops. My kids love having a frozen treat for a snack each day during the summer, but I don’t like all the sugar in commercial treats. So I usually make my own. The nice thing about this frozen yogurt popsicle recipe is that it doesn’t need any added sugar. I have found if you use a ripe banana in the recipe, you don’t need any added sweetener. Since I wanted a 4th of July themed dessert, I used both blueberries and strawberries. The end result is creamy with just the right amount of sweetness. It’s just perfect for a hot summer day. Start by making the white portion of the frozen fruit yogurt pops. 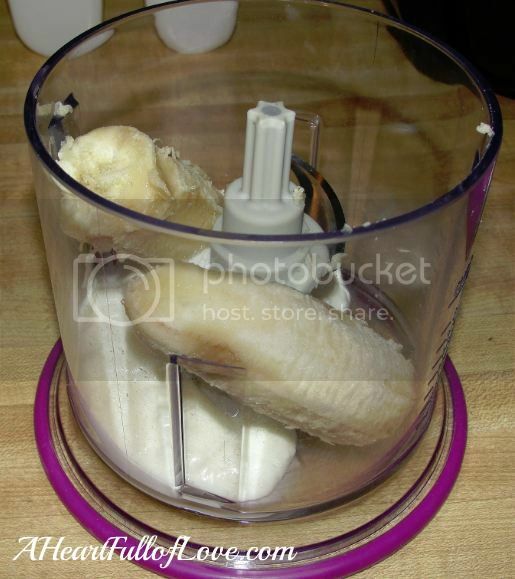 In a food processor or blender, combine 1 banana and 1/3 cup of yogurt. (My little Ninja Express Chop is perfect for making small batches like this recipe. No need to dirty the big food processor for something like this.) Process until smooth. Spoon into a bowl and set aside. 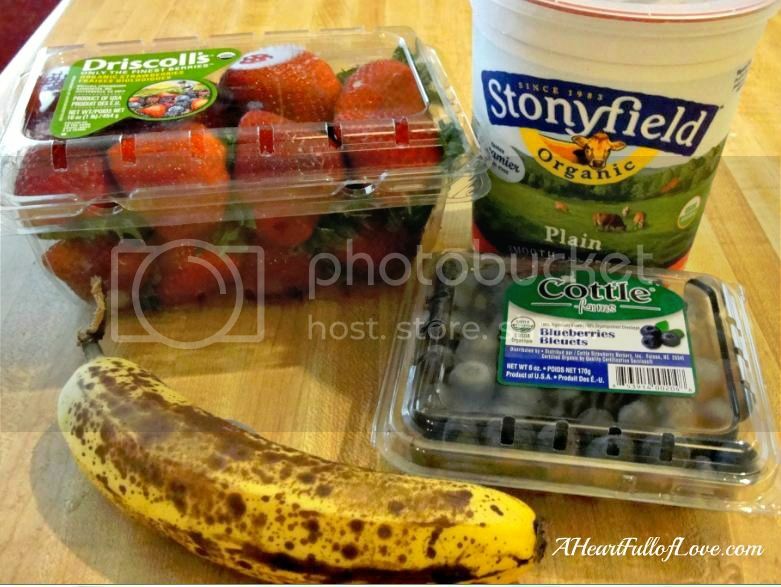 For the red portion, combine the strawberries, 1/2 of a banana, and 1/3 cup yogurt. Process until smooth. Spoon into another bowl and set aside. Spoon the mixtures into the star mold, starting with the strawberry at the top. Use the white banana mix next, and then finish with the blueberry mixture at the bottom. If you use greek yogurt, your colors will probably stay separated better since it will be thicker. I used regular yogurt though and it turned out fine. You will have extra leftover, so go ahead and freeze that in paper cups or regular ice pop molds. Allow to freeze overnight. The silicone molds make these so easy to remove! 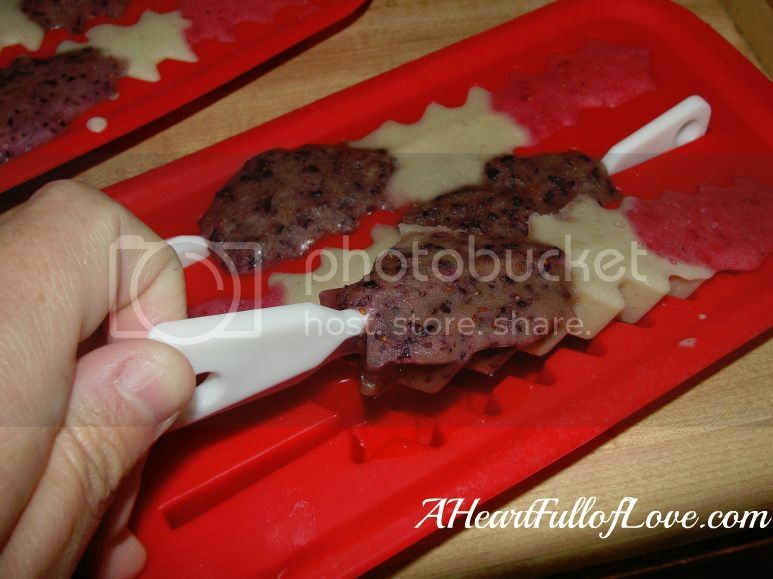 If you don’t have the special star molds, you can certainly use any silicone popsicle mold to make these. Want to make these homemade frozen fruit yogurt pops for the 4th of July? You probably won’t be able to find the molds anymore at the store, but they are still available on Amazon. My kids ask me to make this frozen yogurt popsicle recipe all summer long. They are a much better option than regular sugar-filled frozen treats. Sometimes I switch things up by using different fruit. These frozen fruit yogurt pops are also excellent made with ripe cantaloupe and blueberries. Don’t be afraid to experiment with different fruits to see what combinations you like best. If you make this easy yogurt popsicle recipe, you will have to come back here and let me know how you liked it. So tell me… What are your favorite frozen treats to indulge in during the summertime? I make potato salad, corn on the cob, fried chicken and strawberry shortcake for the 4th of July. We always have Ribs, Corn on the Cob, Green Beans, Watermelon and Peach Cobbler! We love corn on the cob, burgers and hot dogs on the fourth! I just love to make treats that use red, white and blue or fun stuff cut into stars! my whole family gets together and each family brings items i bring a side dish and a desert. 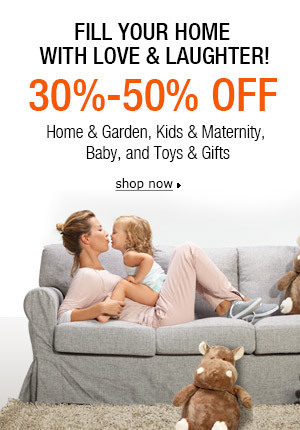 Pingback: Giveaway Promote | Wilton Patriotic Ice Pop Molds Giveaway | Find and list giveaways and giveaway events. I always make a fruit tart using blueberries, strawberries and bananas. We do the typical grilling foods but I also do a poundcake cut up in a triffle bowl with layers of strawberries, cool whip and blueberries. what fun! I love making my kids healthy frozen snacks too! grilled food and cold drinks! I made bbq, baked beans, potato salad, and cheese cake! Now that my father is passed and my husband has to work my grandmother and I will have a “picnic” in our backyard. 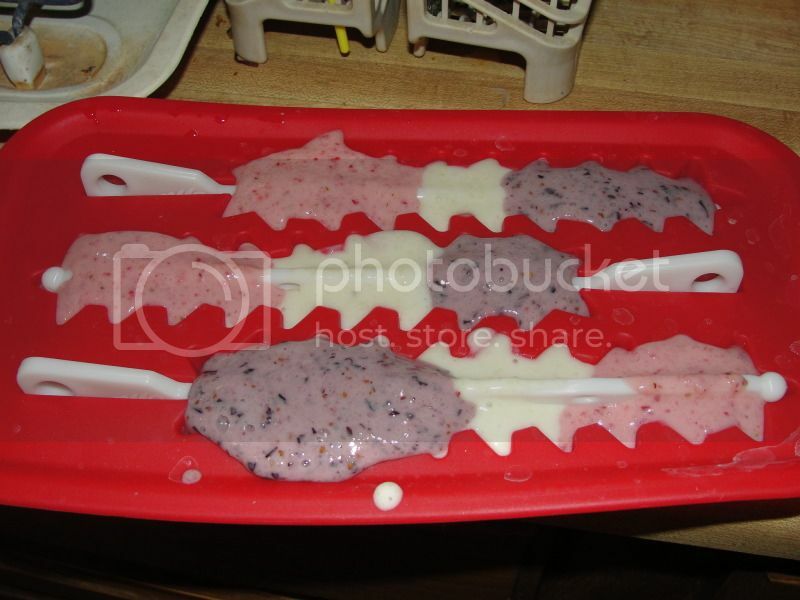 But as for the icepop molds it would have to be strawberries, vanilla yogurt, and blueberries for the red white and blue. I like the traditional fare, like corn on the cob, pasta/potato salad, watermelon, hot dogs, hamburgers and now these yummy, healthy ice pops! I make homemade strawberry shortcake! I like to make red, white, and blue smores. I make cherry cheesecake, pickled boiled eggs dyed blue, pickled beets, potato salad, and drink any red juice. I usually make a strawberry, blueberry, and green grape fruit salad! I like making fruit loop cereal bars. I don’t have any traditional 4th of July foods. These are really neat, thanks for the giveaway! I always make Taco Dip. I make all kinds of red, white & blue desserts! I always bring jello pretzel salad. We don’t make food for the 4th, we go to dinner at the local yacht club and then watch fireworks! I decorate cupcakes with red, white and blue. Anything red, white, and blue. We make popsicles, cake or muffins, fruit kebabs, layered parfaits, banana pudding…try to change it up every year in the dessert ares. Always have hot dogs, hamburgers, potato salad, etc. We always have a big fruit salad for dessert with plenty of watermelon. I grill up the hamburgers and hotdogs. Potato salad, red white and blue cupcakes or cake, corn on the cob, strawberry sweet tea, and hamburgers. I always try to do baked beans and potato salad. Thanks for hosting! These are so cute and easy enough for all to enjoy! I like having a barbecue so it’s the standard watermelon, hot dogs, and burgers. Chicken kabobs on the grill! I always live to do an angel food cake with strawberries, I’ve cream and blueberries! Yum! We grill!!! hot dogs and hamburgers! We have a big BBQ and I make potato salad,hamburgers,beans and cheesecake! We always have strawberry shortcakes with a few blueberries sprinkled on! Red, white, and blue salad with strawberries, blueberries, and marshmallows! I always end up making a pasta salad. I love red white and blue berry trifle! I always make a flag fruit pizza. It’s super easy and everyone loves it at the family BBQ. I also bring veggie burgers, because I don’t eat meat. All the desserts that they make have the red, white, and blue colors in it! We normally grill out for the fourth. Crab dip and pasta salad. Definitely grilled corn and burgers! Awesome recipe! Perfect for lazy summer days and cookouts!